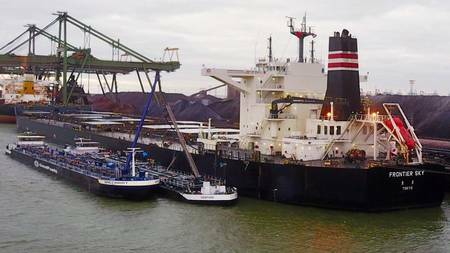 Japanese shipping company NYK, global mining company BHP, green biofuel company GoodFuels and the developer of blockchain applications for the maritime industry Blockchain Labs for Open Collaboration (BLOC) bunkered biofuel in the tanks a BHP vessel in Netherlands. The Netherlands based GoodFuels Marine, a supplier of sustainable low carbon marine fuels, has annouced the successful delivery of sustainable biofuels to the BHP-chartered, NYK-owned bulk carrier Frontier Sky, with CO2 savings verified with BLOC’s blockchain fuels assurance platform. The advanced biofuel, supplied by GoodFuels via logistics partner Varo Energy, is a ‘drop-in’ marine gasoil (MGO)-equivalent, and was blended with conventional fossil-based MGO in a mix of 30% biofuel to 70% conventional MGO. This delivery saves over 50 tonnes of CO2, equivalent to the greenhouse gas (GHG) emissions of approximately 125,000 miles driven by car, and sets the stage for further savings, driven by switching to this carbon neutral fuel. This is an important step in the decarbonisation strategies of both BHP and NYK. NYK was recently recognised as a global leader on corporate climate action by the environmental non-profit organisation CDP, achieving a place on the Climate Change A-List for its climate strategy. NYK’s reduction targets for GHG emissions are 30% per ton-km by 2030 compared with a 2015 base year, and 50% per ton-km by 2050. BHP works with its customers to help them improve the productivity and environmental performance from the use of its products, and is identifying more strategic relationship opportunities to achieve material emissions reductions. Abdes Karimi, Head of Strategy and Planning at BHP said: “We recognise we have a stewardship role, working with our customers, suppliers and others along the value chain to influence emissions reductions across the full life cycle of our products. We fully support moves to decarbonise the freight industry, including implementing IMO2020. Biofuels offer an innovative approach to more sustainable bunker fuel. It’s important for us to ensure the biofuel we use is sustainably produced and traceable."